Moose Munch Holiday Party - Home. Made. Interest. 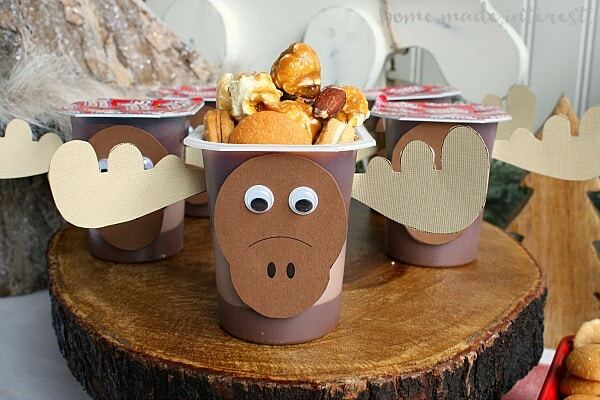 Gotta keep the kids entertained over winter break so we’re throwing a Moose Munch Holiday Party! The holidays go by so fast! I feel like we were just getting ready for Thanksgiving, and now we’re making shopping lists, and planning our Christmas dinners. Next thing you know it’ll be 2016 and spring will be just around the corner! Now that we are older and have families with small children celebrating the holidays means baking cookies with mom, holiday plays, and of course a long winter break from school. 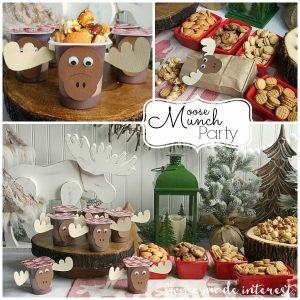 I don’t know about you but I’ve gotta have things planned for my kiddos or all of us get slightly stir crazy, so this year over the break we’re inviting a few of my son and daughter’s school friends over for a kid-friendly holiday party and I’ve got a few tips on how you can host your own Moose Munch Holiday Party. This post contains affiliate links. That means that we may be compensated if you click a link and purchase something. Thank you! First, let’s talk about the food. This party is going to be for kids so that means no fancy hors-d’oeuvres just lots of fun. One thing all kids love is a sweets bar. Somewhere they can pick and choose what they want and combine everything together into their own special mix. 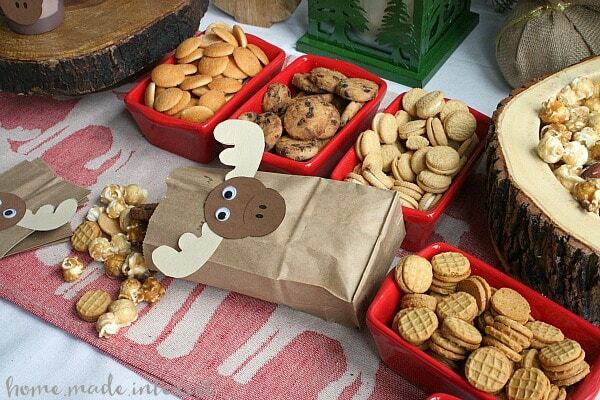 In keeping with the theme we’ll call this a make-your-own moose munch bar. I’m not talking about that stuff you find stores, I’m talking about getting to make your own custom mix of Nilla Wafers, Nutter Butters, Chips Ahoy Chocolate Chip Cookies, OREOS, Crunch ‘n Munch, and Poppycock, and then mixing it into a Super Snack Pack pudding cups! See? You’re totally wishing you were a kid right now aren’t you? When you are creating a make-your-own food bar you have to think about all of your mix-ins and how you are going to serve them. You can find ramekins in all different shapes and sizes at WALMART and during this time of year they are always a great price. 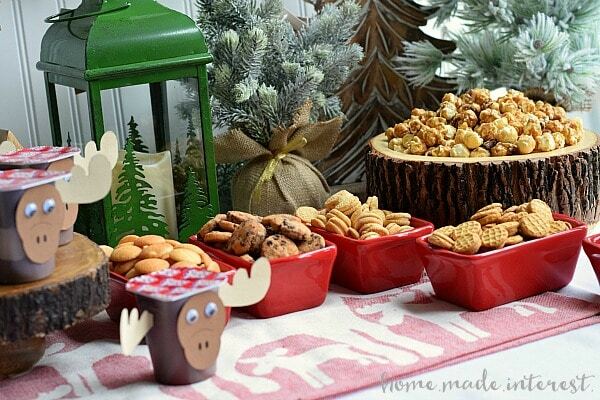 Since moose make me think of log cabins in the woods, and because this is a holiday party, I choose a bright, cheerful red for my containers, but white goes with anything so grab some of those if you see them! You’ll also want a big bowl for the popcorn. I bought Poppycock and Crunch ‘n Munch because I really like both of them and couldn’t decide. I mixed them together and put them in that awesome log bowl. Too cool right? I found that last season and I’m still in love with it. Now, since this is a party for the kids you’ve gotta up the fun level. So, before everyone gets down to the business of munching on cookies, candies, and pudding, first they have to assemble their moose. I created two different templates, one for moose antlers and one for moose faces. I printed each on to different color scrapbook paper and then cut them all out. Don’t worry guys, I’ve got your backs, you can download them HERE and HERE . 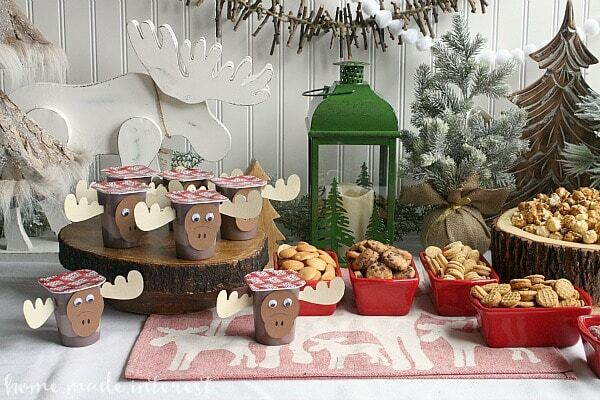 Before the party start set up a table, you don’t want this craftiness happening on the food table, and lay out your antlers, faces, and some googly eyes (because you know it isn’t a party until you break out the googly eyes! ), along with glue or my personal preference glue dots, and of course the Super Snack Pack pudding cups. I highly recommend you use glue dots for this because they don’t have to dry and these kids are going to want to get to the main event! 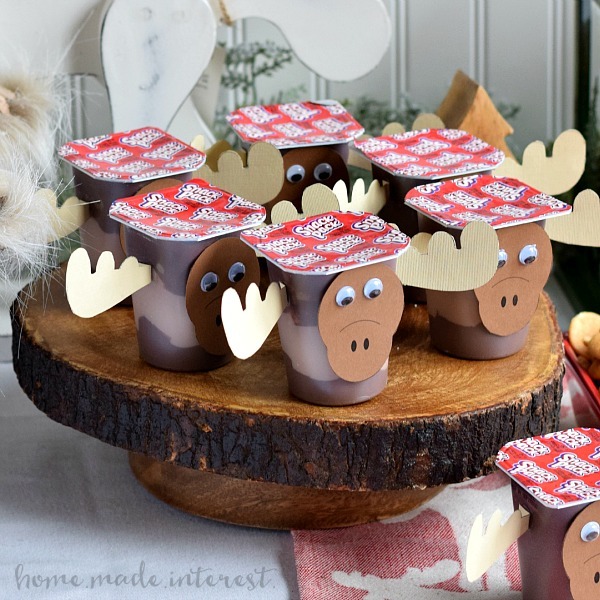 When the kids arrive have them head to their moose-making station to assemble their moose. Here’s what they will end up with. Look at that moose face, too cute!! Serveware – I think this is my favorite part, I’m kind of a serveware addict and I have a lot of stuff in my stash. One thing I always do when I have a buffet table is add a little height with tiered platters or cake stands. For this party I happened to have a cool log cake stand but that isn’t required. You just want something to lift some of the food off of the table. You can even use something as simple as a box that is either covered with pretty paper or draped with a cloth to conceal it. Table Decor – I like my buffet tables to look full so I fill in the spaces behind and around the food with decorations that fit the theme. 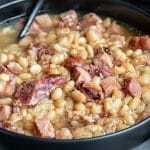 This one is easy, especially since we are in the midst of the holidays. 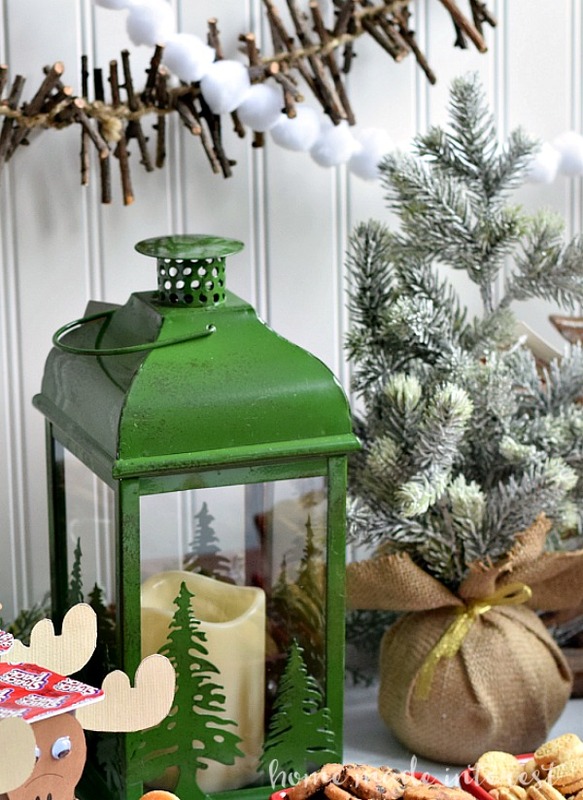 Moose are everywhere and we found that pretty white one at a local home decor store along with mini pine trees and lantern in the perfect color green. Layer everything on the table to make it look full. Last, but certainly not least, every party needs a goodie bag. 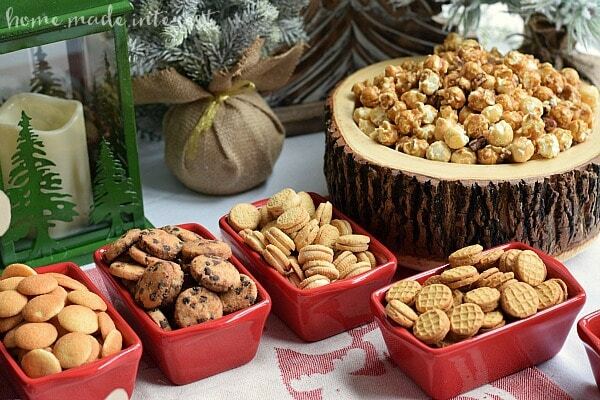 You don’t want your guests to go home empty handed! 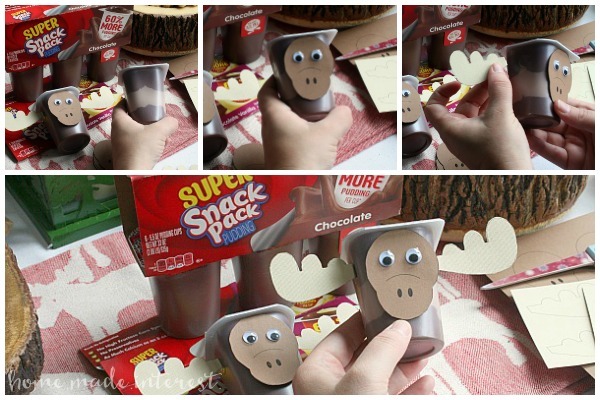 I used my moose head and antler templates to make a few extra moose and glued them onto small paper bags. 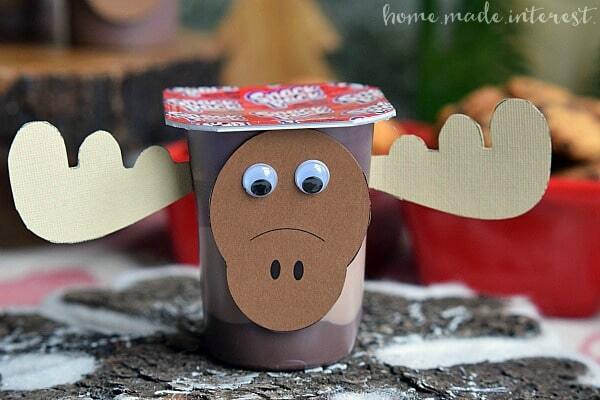 The kids can make their moose munch and chow down on their Super Snack Pack pudding cups filled the the rim with mix-ins, then before they leave you can send them back to the moose munch table to make one more batch of their own special moose munch. Then they can take it home to share with mom and dad. Always gotta have a plan for getting rid of the leftovers, otherwise they end up in my belly! That’s it! It’s a fun afternoon for the kids, and the parents, to play, eat and just have a good time! 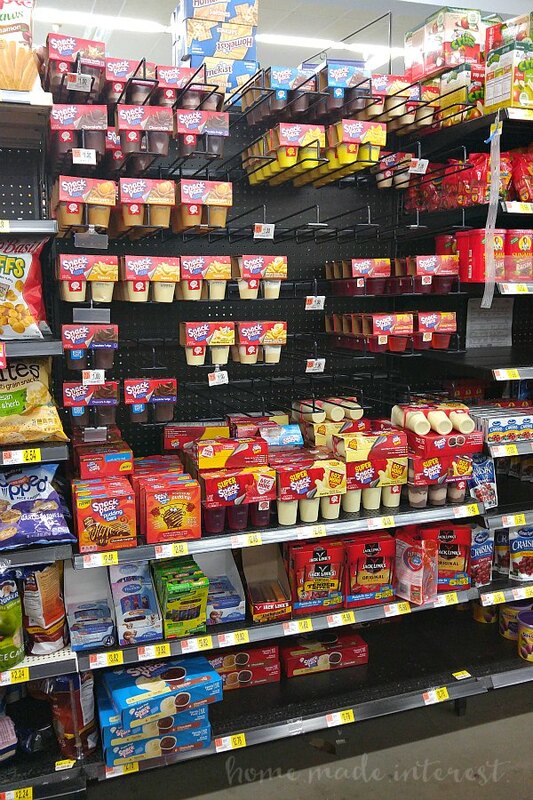 You can find decorations, mix-ins, and Super Snack Packs in chocolate, chocolate and vanilla, and vanilla flavors at WALMART. What ideas do you have for keeping the kids busy over winter break?